With about 24 seconds left in the fourth quarter of Game 1 in the 2015 NBA Finals, Lebron had the ball in his hand and a chance to win Game 1 on the road. Instead, James misses a fade away 3 and everything else went downhill from there. 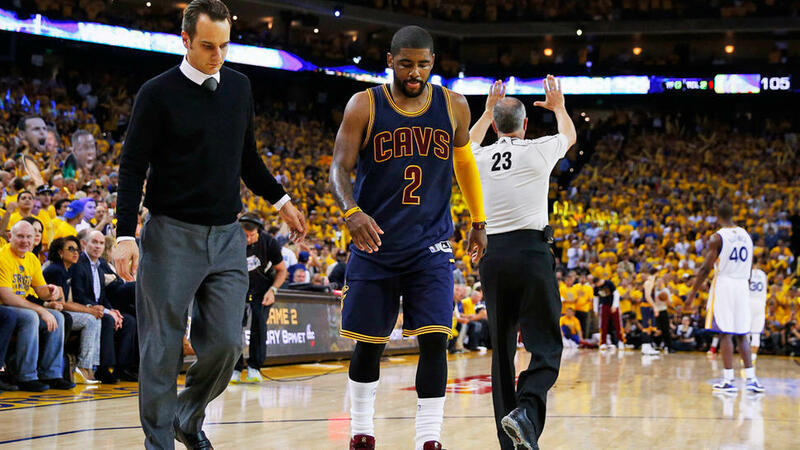 In overtime, Kyrie Irving fractures his knee cap and is out for the rest of the Finals. Easily, the most devastating news I heard all week. The idea of Lebron losing his fourth Finals was a pill I just couldn’t imagine stomaching. After the news broke Friday evening that Kyrie would miss the rest of the Finals, I found myself stressed and depressed. Sitting at the dining room table with my two girlfriends who don’t even know who Kyrie Irving is, I knew I needed to speak with someone just as knowledgable if not more knowledgable than myself. So I called my “LB” Stef, (whom I affectionately call Kips) looking for some sort of silver lining. With fear and anguish in my heart I asked “Do you think it’s really over?”. He replied “Nah, It’s not over”. I was overcome with joy, I found someone who belonged to the 10% of the nation who believes King James can actually pull this off. We ended up speaking for nearly an hour, as we went over stats, matchups, upsides and downsides and our ultimate prediction. After many minutes of deliberation, Stef says (while laughing might I add) “The Warriors really might win in like 6 or 7 but its 50/50”. So much for consultation. After we got off the phone, I was able to analyze the chances and the odds of the Cleveland Cavaliers really pulling this one out. I started to think there are actually a couple advantages the entire sports world is seeming to overlook. For one, we have the BEST player on the planet. Secondly we have the most experienced Finals participant in our generation. Lebron has lost enough ways on this stage to know how to win against a team who has never played in the Finals. Thirdly, the Cavs aren’t the only ones with a “not as difficult as it could have been “road to the Finals. As good as the Western Conference is the Warriors got a break when OKC lost KD and didn’t make the Finals as they could have easily been out in the first round. Golden State also got a break when the Grizzlies had a less than healthy Mike Conley and lost Tony Allen in a pivotal Game 4. The biggest break of them all might’ve been not having to face a Clippers team whom they lost to in the first round of last year’s playoffs. Not to take anything away from an amazing season by Stephen Curry and the Golden State Warriors but they are beatable. 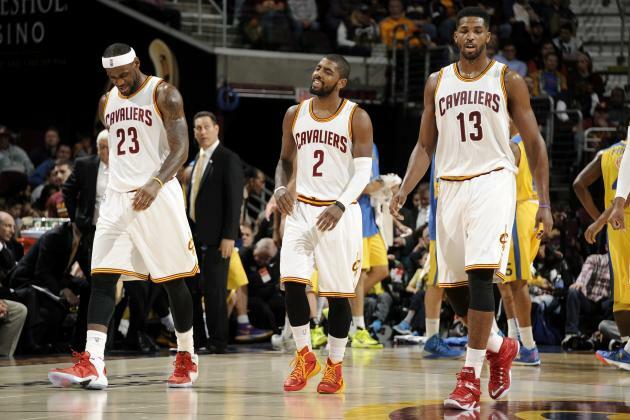 Their biggest advantage over Cleveland is undoubtedly their depth and ability to score fast. After days of pyscho-analysis(emphasis on Psycho), I’ve come to the conclusion that the odds of winning are definitely not in Cleveland’s favor but the experience, savvy and sheer talent of Lebron James will catapult this team to victory. It may take an extra game but we WILL defeat the Warriors. A text from Stef, with stats of Lebron with and without Kyrie on the floor helped soothe my worry but the best message I received from a fellow sports analyst in the most confident whisper was “It’s still Cavs in 6”. Let the games begin. Who’s in your Top 5 ? Point guards of present day NBA are not only averaging 9 to 10 assists but have been able to put up 20 to 23 points a night. Some may say that these new age point guards are hybrid two-guards, who have a shoot first mentality. One of the NBA’s hottest topics has been the new “golden age “of floor generals and most importantly who is the best of the class ? 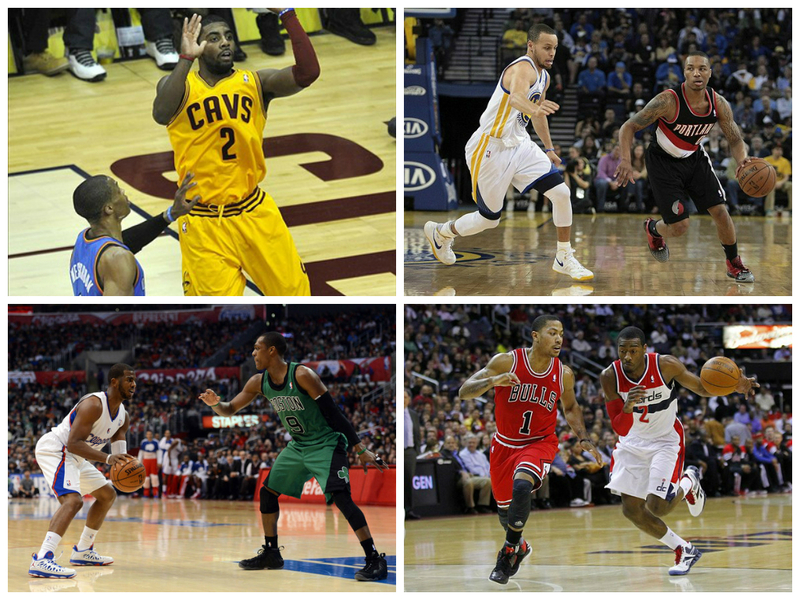 We took the discussion up here at The Starting Point and rated our Top 5 Point Guards in the NBA. It is no surprise that one Stephen Curry is at the top of my list of point guards in the NBA, Steph can easily be one of the top 5 all around players in the league; he’s just that great. His shooting ability and efficiency makes him by far the best shooter in the league and is in contention to be the best shooter ever. Steph is averaging 23 points and 8 assist and shooting 92% from the free throw line. He is not only excelling at passing but he can pull up from thirty as Stephen A. Smith would eloquently put it. These qualities have made the claim that he is the best point guard in the league very easy. Stephen Curry beat out Lebron James for the most NBA All-Star Votes, with over 1.5 million votes. As the run-away leader in the MVP race, Stephen Curry game has improved tremendously over the last three years. Aside from playing alongside players like Andrew Bogut and veteran player Andre Igoudala, Curry is a part of a unique fraternity; “The Splash Brothers”. When you pair him with stud Klay Thompson ,who together form “The Splash Brothers”, he is simply unstoppable. Not to mention, his team has the best record in the league, 36-6; they also play in the super-competitive western conference. Do I see the NBA Finals in their future? The Washington Wizards have emerged as title contenders this season and in large that is due to its starting PG John Wall. This season Wall is averaging 17 points and 10 assist and shooting just about 50% from the field. Wall’s speed, agility and athleticism have propelled him to elite status among his counter parts. Not only has his mid-range game improved but his basketball IQ has done the same. When Wall was drafted first overall into the league in 2010, he only knew one gear and that was full-steam towards the basket. Wall now knows how to slow the game down and play at multiple paces. Wall broke Wizards record for most consecutive 12 assist games earlier this season. Wall amazes fans night in and night out with his crafty moves to the basket and agile passes to the likes of Nene and Paul Pierce. It doesn’t hurt that he has, rising-star guard Bradley Beal in the back court with him. Starting point guard for the Cleveland Cavaliers and playing alongside the best player in the world in Lebron James, Kyrie’s star still isn’t dimmed. Averaging 20 points, 5 assist. and shooting about 50 percent from the field, Kyrie is best known for his incomparable ball handling skills. When soaring past defenders, he appears to have the basketball on a string and still manages to finish at the rim. Arguably, the best finisher in the game, Kyrie has found some of the most creative and athletic ways to get past post-players that tower over his 6’3 stature. He has help lead his team to a quiet 5 game winning streak ,after struggling a bit in the start of the season. The Cavs have improved to a 25-20 record and are over .500 in a conference where the top 3 spots are pretty much up for grabs. Kyrie has improved his 3 point shooting; causing opposing teams to not only fear his passes but his lethal top of the key shots. It’s safe to say that Kyrie has a bright future ahead of him. Damian Lillard has emerged as one the most electrifying players in the NBA and in a conference ,where each night he’s facing some of the world’s toughest defensive players; his team still comes out victorious. After being named Rookie of the year in 2013, Lillard went on to lead his team to its first playoff victory in 14 years against the Houston Rockets in 2014. Lillard’s sharp passes, lethal jump-shots and rhythmic moves to the rim allows his teammates to flourish. What sets Lillard apart is his innate killer instinct and the fact that he doesn’t shy away from the moment. Although, Lillard was snubbed from the NBA All-Star starting roster, he is averaging 22 points, 6 assist, and a free throw percentage of 86%. Lillard has proved himself to be not only an excellent point guard but a closer and he’s only in his 3rd season in the league. CP3; standing at just 6 feet tall and in his 10th season is still averaging 17 points and 10 assist. A true floor general and “Young OG”; he is known in the league for his defensive tenacity and his ability to lead his team at crucial points in the game. He has been named to the All-Defensive 1st or 2nd team six of the last seven years. Not only is he able to get in the paint and finish at the rim, he can defend just about any other point guard in the league. Chris Paul plays like a true, traditional point guard, reminiscent of a John Stockton or Gary Payton of the 1990s; this is his best gift and curse. In a hybrid-guard driven league, Chris Paul’s inability to put up as many points as today’s point guards has landed him at 5th on my list. To believe that he was not offered any scholarships to play Division I basketball and made it to the league as a walk-on, is remarkable. Curry has moved into the elite class of NBA players and can be hoisting up the MVP trophy at the end of this season. Curry possesses everything you want in your starting PG, great play-making skills with an unbelievable jump shot, and improved defense (leads NBA with 2.1 SPG). But I have not seen the clutch gene or a true killer instinct come out of Curry as of yet. Mr.Triple Double; Rondo’s game is reminiscent of past guards and something every team needs. Rondo has a knack to make a play whether it’s on offense or defense.The former Celtic guard has not advanced his offensive game which makes him a liability in most cases but Rondo still gives you the qualities of a traditional pass first guard. One of the most feared players in the NBA; Westbrook has the size of the two-guard and the athleticism of a wing player which makes his style of play unbearable for most guards in the NBA. The UCLA’s ill-advised play are his gift and curse and is one of the reasons why Westbrook is not at the top of totem pole for the point guards on this list. If Westbrook cleans up his game and becomes less turnover prone he will definitely be on top. Many question whether to mention Conley in the top tier PG’s of the NBA. Well, Micheal Conley has my vote. To lead a great Memphis team, year after year while averaging nearly 18 points and 6 assist, and improving his stats playing in the tough Western conference. Conley doesn’t have the athletic capabilities of most of the guards on this list but definitely has a classic feel about him. He is often overlooked by many for what he does not have but not looked at for what he does bring to the court. In the beginning of the season, you had no idea that you would see the frontrunner Cleveland Cavaliers in this position early. But the Cavs are going to have their fair share of growing pains as the season comes along with a rookie NBA head coach and supporting stars and role players that have never seen success like LeBron James. Although it’s early in the season, it is very odd to see the alpha dogs of the NBA struggle with their uncompromising positions. If these teams and players can take heed from Aaron Rodgers, they can become acclimated and figure out of the early struggles. Is Cleveland the Paper Champs or are they the Real Deal? 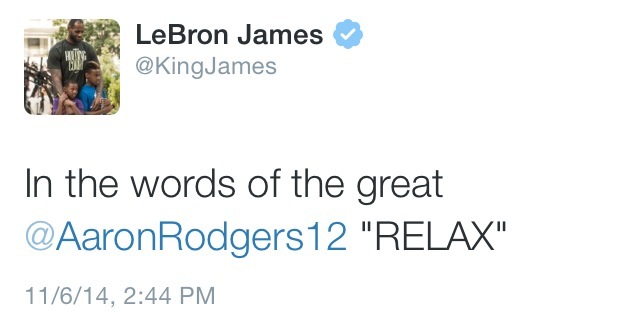 Like James eluded already Relax. Cleveland will find themselves in the Playoffs in the Eastern Conference. It will all start when the team makes its defining roles and everyone steps in and plays their role night in and night out. Who is going to be the Real #2 scorer between Love and Irving? I believe that Cavs should run their offense through Kevin Love similar to how Miami utilized Chris Bosh during the Big 3 era. With Irving and James both accustomed to being primary Ball Handlers, their ability to be off ball playmakers causes even more concerns for opposing defenses. Should Dion Waiters be a starter or a 6th man? I think that Waiters and Irving’s playing style resemble each other’s too much and that it causes too much confusion when on the floor together. Two score first guards will not work on a team that has so many weapons and need the ball to be distributed out amongst them. I think that Waiters will be dealt in the near future or closer to the trade deadline due what these Cleveland team needs. Die Hard Cleveland Fans and Bandwagon fans have no reason to jump ship this early and just have to learn that the inexperience and chemistry will come as fast you want it, it will take time. There are signs for the future to be bright as you earned your first win against the battle tested Chicago Bulls.